Paul sets out how his view of crisis then fits with his long wave theory. Every new wave, he says, is preceded by a build-up of money-capital. That is necessarily true, because every new accumulation of capital begins with the investment of money-capital. Even where constant capital is accumulated, directly, in kind, money-capital is required for the employment of additional labour-power, i.e as variable-capital. That is what marks accumulation out as distinct from the reproductive circuit of existing capital. clearly does not at all follow. There have been many occasions, in human history, where there have been accumulations of hoards of money without that leading to the transformation of that money into new forms of productive-capital. 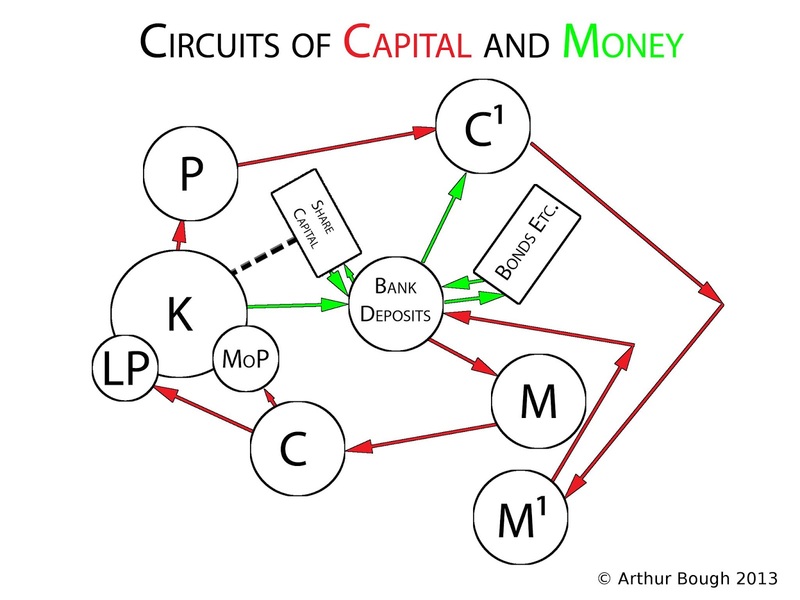 What distinguishes money-capital from money is the social context, the fact that it can be, and is, used as the basis for a self-expansion of value, rather than as revenue. In previous times, such accumulations of money have either sat as treasure, were used to finance conspicuous consumption, or, as Marx describes them, as antediluvian forms of capital, i.e. 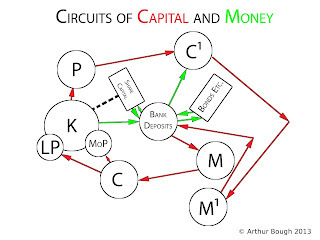 usurer's capital and merchants capital. As Marx describes, the process of primitive capital accumulation, it is certainly a necessary condition that capitalists have a hoard of money-capital, so as to concentrate the means of production and consumption in their hands, but it is not the build up of this money-capital that calls these means of production into being. In terms of the process of secondary accumulation, of the surplus value produced by variable-capital, that surplus value first takes the form of realised profit, before it is available for accumulation. The higher the rate of profit, the greater the potential for accumulation, and the rate, and more crucially the mass of profit is increased by the introduction of productivity raising technologies. As I have already described, those new productivity raising technologies are introduced in response to the squeeze on profits, caused by the fall in the rate of surplus value, as wages rose. So, as Marx describes, in relation to primitive accumulation, it is not the existence of money-capital that calls it into being. The capital itself is already in existence, the money-capital simply enables its accumulation, concentration and centralisation. If we take the 5th wave that I argue began in 1999, then we see that, in the preceding wave, the crisis phase began in 1974. Labour supplies had been used up, wages (including the social wage) had been rising for 25 years, and from the period 1962 onwards, were not being fully offset by productivity rises, so that the rate of surplus value began to be squeezed, which led to the profits squeeze of the 1960's and 70's. From the mid 1970's, capital increasingly engages in a new Innovation Cycle to introduce labour-saving technology. That cycle peaked, as predicted, in 1985 (long wave theory predicts the Innovation Cycle peaks about 40 years prior to the end of the uptrend of the subsequent wave). All of the new technologies – at least the basic technology – already existed, therefore, long before the commencement of the current wave. They were being introduced from the late 1970's onwards, and were, as has happened in all such previous waves, the basis for the undermining of the power of labour. In the 1980's, it undermined skilled workers in the print industry, for example, first by creating large numbers of instant print shops, based upon computer typesetting, and photocopiers, and then to the use of semi and unskilled workers to produce newspapers and magazines, as with the creation of Eddie Shah's “Today”, produced in Runcorn, which led on to the battles at Wapping etc. It is always this process which creates a relative surplus population, reduces wages, and boosts the rate of surplus value that creates the basis for the accumulation of hoards of money-capital. The question is why does this capital not get rolled out extensively during the stagnation phase of the cycle, e.g. 1927-39, 1987-99. The answer is quite simply that capital requires there to be sufficient demand for commodities before it gets involved in new large scale investment. Moreover, whilst the new technologies get introduced into production, replacing existing machines, for a new wave to commence requires new markets to be developed, which also takes the form of new ranges of commodity. The new industries, based on the new technologies, for the fourth wave, such as motor cars, domestic appliances, and so on, began to be produced and sold by the mid 1930's, but it is only with the start of that new wave, after WWII, that these industries actually take off, as also with residential property. Similarly, the technologies of the fifth wave began to appear in new consumer goods industries in the 1980's and 90's, in the form of the first PC's, video game consoles, video recorders, mobile phones and so on, but its only as the new wave started to get underway that these technologies really see a take-off of the new industries, based upon them, and yet I will argue the reason this fifth wave is stalled is that QE, and the requirement of the owners of fictitious capital to keep asset prices inflated has artificially held back that investment and development.